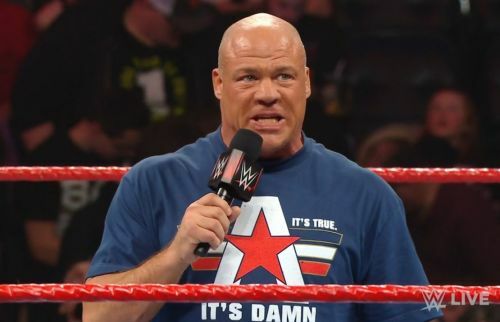 This past week on WWE RAW, Kurt Angle made a surprising announcement where he revealed that his last match in the WWE will be at WrestleMania 35, following which he will retire from in-ring competition. Following RAW, Angle dropped a huge hint on the person he may face at WrestleMania 35. Angle announced on this week's RAW, which was from his hometown of Pittsburgh, Pennsylvania, that he will retire at WrestleMania 35, where he will have his farewell match. Angle then had a match with Apollo Crews, where he hit an Angle Slam on Crews and got the win in his final match in front of his hometown audience. Angle and Crews embraced in an emotional night for the Olympic gold medallist. Backstage, Angle said that he will have to work harder than he has ever had, in the build-up to his final match at WrestleMania. He said that there will be a lot of mental and physical preparation, and that he will want to give a "WrestleMania performance", and that he will have to train as hard as he did while training for the Olympics or the WWE Championship. Angle then revealed the names of Superstars whom he could face at WrestleMania 35. Angle revealed that it could be any of John Cena, whose debut match on WWE television was against Angle, while he also said that his former TNA opponents, AJ Styles and Samoa Joe, as well as Drew McIntyre, Bobby Lashley, and Baron Corbin, could be his opponent at WrestleMania 35. He said that he hoped that he could win the match and have a WrestleMania moment. WrestleMania 35 will take place on April 7, 2019.